Register as New Panelist and win BPoints! (Contest has ended) Register as New Panelist and win BPoints! 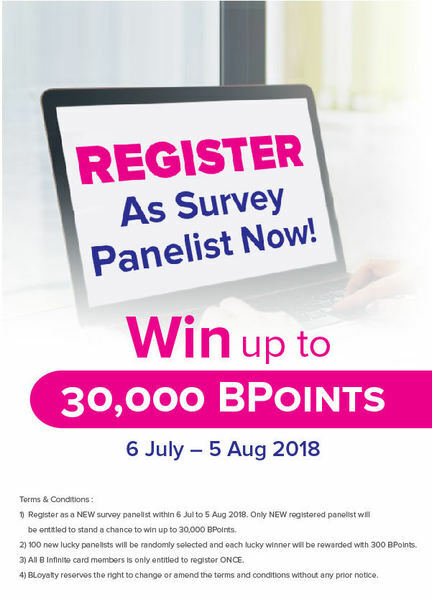 Register as a survey panelist from 6 Jul to 5 Aug 2018. This campaign is only applicable for NEW panelists that did not register as survey panelist before. All B Infinite card members are only entitled to register ONCE. 100 new lucky panelists will be randomly selected and each lucky winner will be rewarded with 300 BPoints. Winners announcement will be made within 10 working days after the campaign ends. BLoyalty reserves the right to change or amend the terms and conditions without any prior notice.